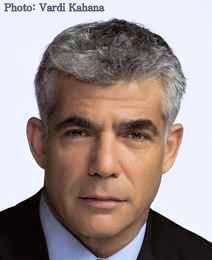 Yair Lapid, writer, popular TV host, journalist, and former Finance Minister of Israel, was born in Tel Aviv in 1963. He grew up in London and Tel Aviv, and began his journalistic career while still serving in the army. After his discharge, he wrote for the daily Maariv, and published poems in literary journals. In 1986, he worked as a movie director for Cannon Films in Los Angeles, and in 1988 he became editor of the weekly Tel Aviv. Lapid's varied career has also included songwriting, lead parts in movies, literary translation, writing a musical, producing documentary interviews with international figures and hosting entertainment and talk shows on Israel TV. For many years, he was also news anchor on Channel 2 TV. In 2012 Lapid left Channel 2 and entered politics. He founded the Yesh Atid (There Is a Future) Party, which became the second largest party in Israel in the 2013 election, and served as Israeli Minister of Finance from March 2013 until December 2014. Lapid's four suspense novels have been bestsellers, and for his bestselling non-fiction books he has received the Publishers Association's Gold and Platinum Prizes (2006; 2010; 2011; 2015).